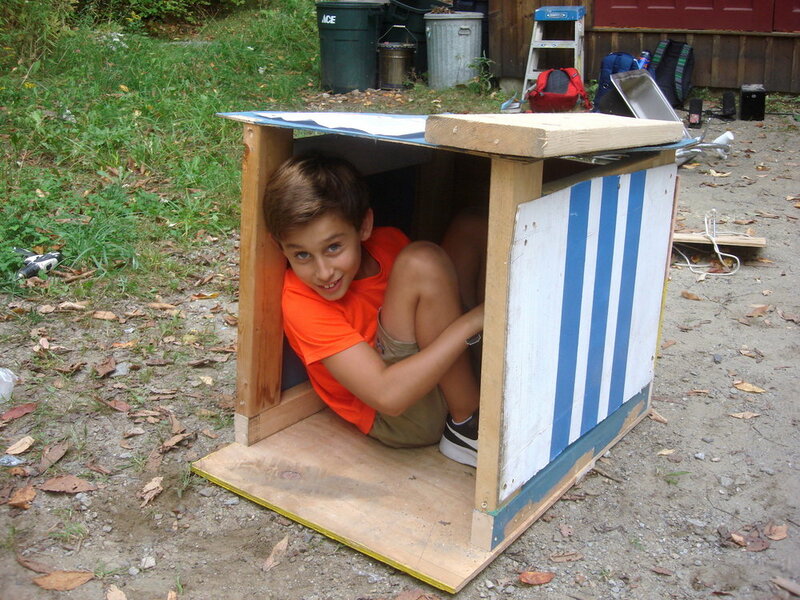 Throughout this six week program kids, ages 6-12, designed and built a mud kitchen for Spring Hill School in Waitsfield, Vermont. The mud kitchen play space includes a water pump, cupboard, canopy, cutting table, oven and a pair of sinks. The furniture and structures are meant to encourage imaginative play with natural materials such as mud, grass and sand, and household kitchen items like sinks, plates and kettles. This project was an opportunity for children to create something permanent that will be enjoyed by the SHS community for years to come. On the first day of the project all the youth participants met at Spring Hill School to introduce the project to the preschoolers and brainstorm all of the components of the mud kitchen. Almost all of them had attended SHS for preschool and were overjoyed to be back in the space reminiscing about their early childhood memories. After introducing each other and discussing some possibilities for the project, the whole group walked down to Foster forest to see the site of the proposed play area. The SHS kids gave us a brief tour of the space, showing us the brook and some good places to find mud. After seeing the site it was time to roll up our sleeves and get to work. A variety of activities were prepared to get everyone thinking about the play kitchen, including plywood pizza slices to be decorated with toppings and wooden crates to store all of the pots and pans. Jasper showed the group an example of a menu he made out of plywood and chalk paint. Jasper and Kai set up a painting station where the Spring Hill students could paint their own menus. Pizza slice blanks were cut in the shop before class. The preschoolers got paint them and glue on scrap wood toppings. Another station was set-up to assemble crates that would hold our pots and pans in the future. Kids used hammers, nails and pre-cut boards to put them together and brought them outside to paint afterwards. The rainy afternoon created perfect conditions for playing in the mud. After packing away the tools the kids went out to the playground and dug out pools and water tunnels with their shovels. On our first day in the shop the group started by putting their heads together and sharing some ideas. They were given a few items to help inspire the process - a couple of sinks, water pump, some PVC pipe and a pile of scrap wood. Before starting our build session we made a list of all of our materials. Jasper, Hannah and Mason started tinkering with the water pump. They attached the PVC pipe to the pump and experimented with a bucket of water. After toying with it for a few minutes they finally got it to work and started pumping water. The next step was to make a stand for the pump. Jasper took some measurements and cut a couple of 2x6's to the height he imagined would be appropriate for preschoolers. He then used a spade bit to cut an opening for the PVC pipe with some help from Mason and Lincoln. Lincoln decided he wanted to make a fixture for one of the old sinks we recycled. By the end of the day he had made a frame and was designing a door for the front. Lincoln and Hannah visualizing how the play sink would be used by the preschoolers. Jude set out to make a dishwasher with a sliding rack. He measured, cut and started assembling his idea out of 2x4's and plywood. Hannah rigged up a clothesline pulley. She had an idea to install them between the steam and the mud kitchen so that the kids could transport water back and forth. We started the session by trying out the ropes course and roller coaster made by the homeschoolers. Gathering to make plans and set goals for the afternoon.